The company's product lineup includes Aluminum Electrolytic Capacitors, multiple-layer ceramic chip (MLCC) capacitor/array, chip-resistor/array & networks, Tantalum Electrolytic Capacitors, disc capacitors, varistors, and chip fuse. The Company mission is competitively priced, high-quality passive components for critical applications. Founded in 1980, the primary goal of the company has been to provide outstanding service to E.M.S's and O.E.M's. 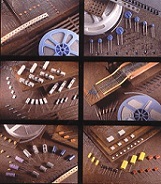 In 1983 IBS reformat itself as corporation that markets electronic components for high tech industries worldwide. IBS is a privately held corporation with a steadfast commitment to quality, service and fast deliveries. With over half a century of combined management experience in electronics design, IBS Group has become a recognized electronic components supplier worldwide. Copyright © 2010 - 2019 RG ALLEN® is a IBS ELECTRONICS COMPANY.